Alternative proteins are on the verge of becoming mainstream and ‘stealing’ growth from traditional meat products as they play a growing role in meeting consumer needs and preferences, according to a recently-released global research paper. The report, Watch out…or they will steal your growth by agribusiness banking specialist Rabobank, examines why alternative proteins – including plant-based meat substitutes, emerging insect or algae-based products and lab-grown meat products – are starting to successfully compete for the “centre of the plate”. Report author, Rabobank global sector strategist for Animal Protein Justin Sherrard, says it is the ‘growth’ – rather than the current market size – of alternative proteins that is of greatest significance. And this momentum – along with increasing interest from start-up companies and investors – is also likely to see the market share of alternative proteins grow and become more established in other mature markets, including New Zealand, says Mr Sherrard, a Netherlands-based Australian. “Three of the strongest demand drivers for alternative protein products are essentially those that are ‘pushing’ consumers away from regular animal protein consumption, namely concerns around health, animal welfare and sustainability,” he says. And with alternative protein companies adept at tapping into these drivers, Mr Sherrard says, market share growth is set to rise, particularly for meat substitutes – the most mature of the alternative protein products. 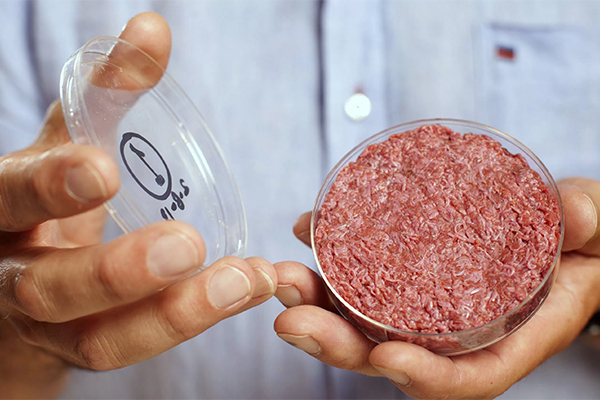 There are also opportunities for insect or algae-based products, and lab-grown meat products, but in many cases inroads still need to be made to gain consumer trust and regulatory approvals. Based on these growth rates, and the outlook for relatively flat consumption growth of traditional meat products in the EU, Mr Sherrard says alternative proteins could represent one-third of total EU protein demand growth in the next five years. “In the US and Canada, alternative proteins are forecast to grow at a slightly lower rate of six per cent to reach 165,000 to 200,000 tonnes by 2022,” he says. “Rabobank believes that domestic market penetration of alternative proteins and substitute foods in New Zealand and Australia will lag behind that in the EU and US, where current market development efforts are focused,” he says. “Similarly, their adoption in the emerging markets that we export to are also likely to lag – with most consumers still trading up to traditional protein products, like red meat and dairy, rather than embracing meat ‘analogues’. Emphasising the naturalness of traditional food products is a useful strategy, Mr Hunt says, but in many cases isn’t likely to be enough in itself. “In line with their processing partners, meat producers need to recognise what is driving these substitutes, and do what they can to tap into the desire for healthy, sustainable and novel products delivered through a supply chain that consumers trust,” he says. On an international level, Justin Sherrard says, animal protein companies servicing the EU and US markets have several options to help avoid stagnating sales, or worse, in these regions. “These include investing in product innovation to improve the health benefits of their products, managing animal welfare, and improving the sustainability and transparency of their business operations and supply chain” he says. “Alternative proteins are not the only answer to the question the market is asking right now. But right now they are the answer that is attracting the most attention”. With synthetic meat & fish NZ no longer has a competitive advantage. We don't have economies of scale & face transport costs as well. We also face carbon emission costs. NZ has probably hit peak meat & faces a long term systemic risk from synthetics. The natural meat & fish market will only grow/hold steady if new markets open up as the world as a whole gets wealthier (assuming synthetics find their first markets in developed countries). Over the long term the exchange rate will probably have to fall to compensate & we find competitive advantage in other areas. Can't wait to see the price of porterhouse steak crash because effeminate hipsters are dosing up on eostrogen filled, soy based synthetic meats. It's a win win for testosterone filled meat eaters! If the lab techs can reach somewhere near 'Pareto effectiveness' (80% of the taste for 20% of the price) they'll seriously eat into the traditional meats' market share I reckon. And this would lead to a permanent reduction in the raising of livestock for slaughter, so I suspect any crash in traditional meat prices would be transitory, as the big kill off would never be replaced by new animals being raised. Currently it is about 20% of the taste for 8000000000% of the price for lab grown meat (no joke) and there is a big difference between share of growth (in a stable market) and share of actual market. But even if those numbers reversed, NZ farmers can easily switch crops. I'm watching dairy farms get converted to hops and sheep farms go into vineyards. It's all a bit of the same old way of NZ farming really, we take what works turn it into a manic bubble, then move on to the next craze. ..easily switch? Not for long. "On average, Waikato’s productive pastoral, horticultural and arable surface soils now contain five times more cadmium than they began with, and are two-thirds of the way to the 1 mg/kg threshold"
There is now a Cadmium Working Group that actively manages fertiliser management on farms notified as having high cadmium levels. Farmers can ask to have their cadmium levels measured when doing their soil tests. Phosphate Fertiliser from North Africa has lower levels of cadmium than other areas and Ballance Fertiliser Co-op has a policy of sourcing phosphate from North Africa. I'm not aware of where other companies source their phosphate from. If someone will pay me, I'm perfectly happy to destock and sit on my deck farming carbon. had a meal out in nelson last friday...all the restaurants were doing reasonable traffic....vegetarian East street cafe was chocker with people sitting at the bar eating....next day at the flea market saw a vegan butcher doing good trade......i grow lambs! A real test would be a vegan steak and cheese pie. Recently heard a current mainstream political party MP telling a group of farmers that not everyone needs farmers. When asked for an example, they replied that their vegan child was one. Farmers replied that even they need farmers. MP was not convinced - until the farmers ask who grows their vegan food for them. Took a while but eventually the penny dropped. Which only goes to prove just how stupid some/many? of our MPs are. However,those farmers who think that the current model of dairy/beef farming is not going to be significantly affected by non-meat alternatives,will go the way of the dinosaurs. Rabobank has just put out a report on this subject. Smart farmers will begin to anticipate the trend and adapt,change their operations to meet the challenge.